Captorra is a case intake and lead management solution designed to assist law firms specialising in personal injury and mass tort, as well as bankruptcy, criminal defence, and immigration. Captorra offers users tools for lead conversion and client sign ups including intake scripts, process automations, eSignature capabilities, management of physical signup packages, referral management, email marketing, marketing analysis, and reporting. Captorra allows users to create an unlimited number of call scripts, as well as offering a selection of ‘best practice’ scripts, which run a logical set of questions for each caller, with questions either being hidden or surfaced based on previous answers. All data received is automatically associated with the new intake, and users can set an unlimited number of custom fields to suit the data they wish to collect. Based on this information, suggested dialogs are given for the most appropriate course of action, whether that is to take on or turn down the case. In the case of turn-downs, Captorra automates the process using customizable email templates and merging contact details into turn down letters. Captorra integrates into users’ website lead generation systems, as well as after hours call centers and third party lead providers, and automatically imports leads into the system without the need for manual entry of details. Leads can be segmented into different mailing lists for email marketing, such as newsletters, and drip campaigns targeting leads when initial outreach has been unsuccessful. 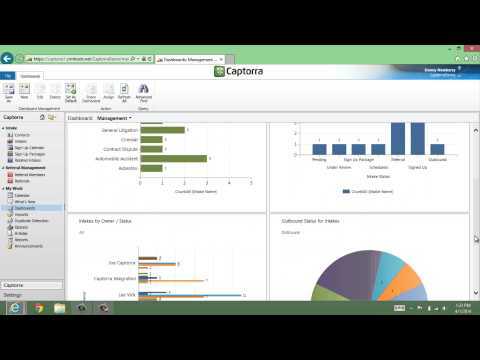 Captorra’s integrated eSignature capabilities enables the immediate signup of clients through their computer, tablet, or smartphone. For situations where eSignature is unavailable or a physical signature is required, Captorra automatically assembles physical signup packages with merged client details to be mailed out. Signup packages can then be managed from assembly to mailing, and return, with follow-ups for unreturned packages. Captorra also manages documents associated with clients and their cases, including engagement letters, contracts, and medical records. Glen Lerner Injury Attorneys LOVES Captorra! PROS: Accountability - Intake and Lead tracking is never easier. All users entries are easily documented and tracked. Entries are date and time stamped, with a very robust AUDIT function on each documented lead or intake. Automation - Certain functions that allow for automation are fantastic. Welcome Letters, Client Information Packages -- all able to be customized to your Firm's specific needs, OR doesn't need to be utilized at all. Compatibility - Works very well with other CRM software - Client Profiles in particular. Web-Based Software - Accessibility for your employees is very high. Have an iPad? Smartphone? Tablet? As long as you have a device with access to the Internet, you have access to Captorra. Simply open any web-browser, go to the specific Captorra URL, and Log-in! CONS: - While accessible via mobile device, it does not yet have a Mobile App. - Monthly cost of License. EXPERIENCE: We at GLEN LERNER INJURY ATTORNEYS have had a wonderful experience working to bring Captorra to our Firm. We believe that the use of this software, particularly in a company that is experiencing growth like ours, has not only increased the effectiveness of our Intake Department; but has also influenced greatly our ability to teach using the analytics collected during the intake process. Information is the new Gold, and this software will give you your moneys' worth. - Want to know who your superstars in your organization are with Clients? - Want to know (if appropriately collected) what advertising you use is most effective? The information you collect is all on the Front Line of your business: from the Clients themselves. How you analyze and utilize that information is up to you and your business. ADDITIONALLY: The people at Captorra really care. They are trying to bring innovation to the Legal industry, and I believe they will not stop with just Captorra. Even the CONS we have listed are being addressed, and probably won't be in the Cons list much longer. They are open and willing to listen to your needs and concerns, and will help you find a solution that best fits your Firm. I don't like that it's built on Microsoft Dynamics - not my favorite platform. There are some basic tech functions that could be better, however for a high volume legal firm it's probably the best stuff out there. Thank you for the kind review and positive feedback Eric! It covers all the day to day basic processes that we as a team needed without all the expensive whiz bangs some of the comparators use as a gimmick. Captorra! - Finally a product that helps. Captorra has streamlined our intake process and made our firm more efficient. We were struggling with understanding and truly grasping where our leads were coming from and if we were benefiting from our Marketing. It has greatly increased our ability to track marketing and we can better focus in the areas where our marketing is weak. The system is extremely user friendly and easy to learn. Customer service is excellent and knowledgeable. There is always a team member willing to help and guide you. Captorra offers users over 50 types of intake scripts, with users able to setup unlimited call scripts to run for callers, with data automatically assigned to the new intake. Turn-downs can be automated, with customizable emails sent automatically and the creation of merged turn-down letters. Email marketing lists can be setup for both standard lists, including Newsletters, and custom lists decided by users, as well as email drip campaigns. Integrations with website lead capture, after hours call centers, and third party lead providers allow leads to be automatically imported into the system without the need for manual entry. Customizable dashboards allow users to see a summary of the information most relevant to them, including number of calls, number of sign ups, active intakes, marketing campaign results, follow-ups, and more. Integrated eSignature services allow clients to immediately sign up through their computer, or using a tablet or smartphone. Signup package management process allows users to track whether physical signup packs have been mailed, if they have been returned, and if any follow-up is required. Below are some frequently asked questions for Captorra. Q. What type of pricing plans does Captorra offer? Q. Who are the typical users of Captorra? Q. What languages does Captorra support? Q. Does Captorra support mobile devices? Q. Does Captorra offer an API? No, Captorra does not have an API available. Q. What other apps does Captorra integrate with? Q. What level of support does Captorra offer? Q. Which apps is Captorra compared to most often?